Those of you who visit our website regularly will be aware that Jack Morton Worldwide, the firm organising the opening ceremony of the Commonwealth Games in Glasgow on 23rd July, was looking for Scottie volunteers to take part. Well, some very fortunate Scotties will be there. Although their actual role is a closely guarded secret, it will be well worth watching. STECS are represented too, with members going with their dogs, and I’m especially delighted that there will be some STECS rescue dogs in the line up. There will also be three Welfare Co-ordinators there, and I’m sure they will take every opportunity to promote STECS and Scotties in general. It’s very seldom that Scotties have such a worldwide platform to showcase the breed, so let’s hope they do us proud! Absolutely fabulous news, good look to all scotties and owners alike, we will be watching. Watching it now. So proud of those fabulous little doggies. Well done to all involved. Lovely wee Highland terriers. Watching ceremonies right now. Typed in query whether dogs with owners. ACE! We loved seeing them on TV here in Canada! Great volunteering. I was so proud of all the Scotties at the Opening Ceremony of the Commonwealth Games – all the people, lights and music, the Scotties coped with it magnificently. Well worth waiting for, the opening ceremony showcased our Scotties beautifully. It must have been such a long day for these dogs but you’d never have guessed it from their jaunty walks around the circuit – Well done to everyone involved! well done what a turnaround for rescue Scotties, a proud day. They didn’t all walk jauntily. What were they, and all wee dogs and cats doing, when the fireworks went off? These were normal wee dogs. Music. Crowd. Would you subject your faithful pal to that? Really? 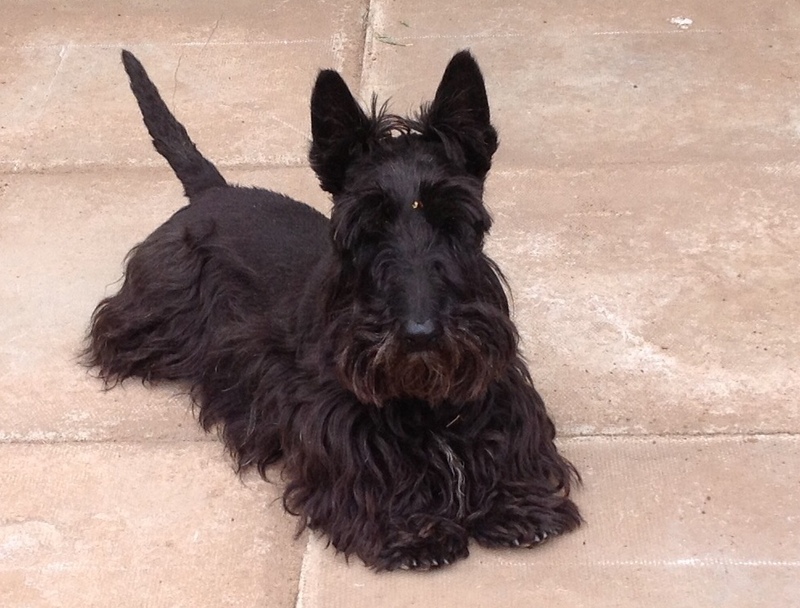 I was there with Mr Beau, my rescue Scottie, who came to me after a difficult start in life. He went to training classes to achieve some much needed discipline, as he’d had no training. Most of the dogs there were ordinary pets, who don’t all walk obediently all the time! The organisers of the event took great care to accustom the Scotties to the ring with increasing noise levels. We were told that if our dog was not happy to walk round then we should simply carry them, and no dog who was walking was in any way distressed. My dog enjoyed the occasion! The organisers were fully aware of the impending firework display, and therefore as soon as the last dog paraded round we were in our bus and whisked away before the firework display even started. Every possible care was taken with these dogs. There was a vet in attendance, and a dog behaviourist, ample water and a dog walking area was set aside for our use. The majority of these dogs were family pets, and their welfare was paramount at all times. Responsible dog lovers would never make their dogs do anything that would upset them. How many of us can get our Scotties to do anything they don’t wish to do anyway? There was also 3 welfare co-ordinators from STECS there. Lucky you and your wee dog, too! Of course nowadays every care/consideration would be taken. Imagine most dogs were delighted to see like-looking playmates! As a pet minder, any arrivals are always disappointed if only my puss and I are here, no canine playmates! Where there is a positive people look for a negative. No cats were at the event to my knowledge which suggest a degree of mis-information, however my time was spent looking after and caring for my dog, so perhaps I missed the cats! The above reply from Isla provides the evidence of the care taken to protect all the dogs that took part. Margaret appears to have been mis-informed about the care, control and love the Scottie owners attending the event showed towards their pets. If you have evidence to support your observations and you are a member please submit your observation in writing and let’s discuss it at an AGM. If you are not a member let me pay your subscription and discuss it at an AGM. Clearly however upon reflection you could withdraw your observation and say sorry to the Scottie owners who attended the opening. Fantastic opening of the games. I am so proud of all the Scotties that took part. This has been marvellous for STECS by drawing people’s attention the STECS and that even Scottish Terriers have a rescue. People from all over the Commonwealth now know about STECS. The Scotties health and wellbeing was taken care of both at the rehearsals and the opening by the organisers of the event. Let’s face it could you get your Scottie to do something they didn’t want to do !.